One of the worst feelings in the world is trying your hardest at something but still falling short. 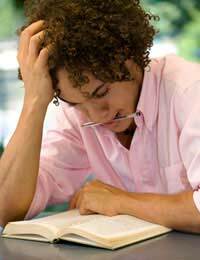 In the case of schoolwork, studying for hours and bringing home disappointing grades may make you feel hopeless or helpless, but this is far from the truth. If you are dealing with disappointing grades, vow to change your study habits and you'll be amazed by the results. The most important rule about dealing with disappointing grades is to act fast. Don't sit around and let them fester, and definitely don't ignore them. Instead, admit that you need help and go in search of it soon. The faster you face up to the problem, the faster you can find a solution and see some results. If you are studying hard and still dealing with disappointing grades, it's probably time to tweak your routine a little. Remember, if you keep doing the same thing all the time you'll undoubtedly keep getting the same results. Mix things up by asking for help, whether from a friend or fellow student, your teacher or a private tutor. Ask for help with the subject matter and tips for studying on your own. Sitting for hours at the kitchen table trying to ignore your family, or opening your books in front of the television does not make for successful studying. Instead, find a quiet space away from the rest of your family. Make sure it has adequate lighting, is cool enough to be comfortable and is away from distractions. Get into the habit of settling into this workspace whenever you have schoolwork to do and soon you'll be flying through your assignments. Looking over your notes from class. Taking new notes while you study. Answering all of the review questions you can find. Talking through events or concepts that are integral to your lessons. Outlining essays that you suspect will come up on an exam. If, after all of your changes and redoubling your study efforts, you are still disappointed with your grades, then it is time to figure out exactly where you are going wrong. Look over exam papers and assignments to see if you are having trouble with a particular kind of question (multiple choice, true or false, etc.) or concept. Examine your essays to see if you are explaining your ideas clearly and completely, or if it is the mechanics of your writing (spelling, grammar, etc.) that is letting you down. Request an appointment with your teacher and use this time to discuss your work and get his/her feedback as well. Dealing with disappointing grades is something that every student will face at one time or another. It won't be fun, but take a realistic look at your attention in class, your study habits and your performance on past assignments and exam. Figure out where you are having trouble and dedicate yourself to fixing these problems. Good luck! Very interesting article on dealing woth disapointing grades. Perhaps it cal help students deal with this problem.